Miss Tootsie — as she's respectfully called — tends the massive iron pits and hissing fireboxes like an admiral minding her fleet. Her gray hair is cut sensibly short. A blue apron is fastened around her waist. During the week, she works as a school custodian. 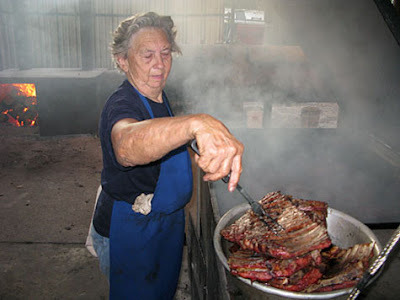 On Saturday mornings, her strong arms turn short ribs and chicken halves, briskets and pork steaks with a practiced flip of the fork. Last week's New Yorker had a nice article on Snow's BBQ (only open on Saturday mornings), which was voted the best barbecue in Texas. NPR also ran a story on Snow's this past summer. We had some excellent bbq when we were in Houston. It would be interesting to sample bbq from all over the American south. I just read that this morning! I liked the line, "After lunch, if that’s what you call a large meal of meat that you finish just before 9 A.M. ...."
One of the best breakfasts I ever had was a bbq brisket sandwich during an early morning layover at the Memphis airport.